Dangerously gooey and satisfying. I am on a kick to try new food bars, not because I think food bars the answer to anything, but because I know that we all need convenience foods that can travel with us without taking up space, without much thought...those quick snacks for times we weren't planning for. For myself, though, I'm afraid that this bar would never fall under that category. I would plan for it...I would work my meals around it. To me, it's that delicious! 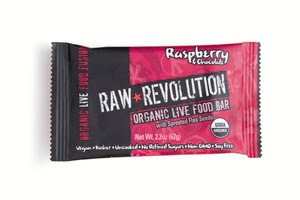 I tried the Raspberry Chocolate Raw Revolution bar and my first thought was that I could really smell the chocolate and raspberry, even before I tasted it...yum. The chocolate is a definite dark chocolate punch. It's not for those looking to replace the sugary sweet milk chocolate candy bars. It's sweet, but not THAT sweet. And the texture...oh my goodness. It reminds me (just a little bit) of those brownies I used to eat as a kid. Those mysteriously textured pre-packaged brownies that were dense, moist, soft and gooey. Yeah, only a little like that, but not so mysterious. The simple and natural ingredients are what drew me to the Raw Revolution bar in the first place. Well, that and the fact that this a gluten free, dairy free all natural raw food bar! The raspberry chocolate bar was made of cashews, dates, agave, cocoa, almonds, raspberry powder, and sprouted flaxseed (sprouted flaxseed...how cool is that?! My GI tract says thank you!). This blends together to create a happy combination of 5g of fiber, 8g of protein and 15g of sugar. The sugar is still higher than ideal, with that agave added (and no, I am not a big fan of agave), but if you want the same delightful textures and ingredients, try the cashew spirulina flavor, which has less sugar! So, while I know I am still better off eating a my green salad topped with brown rice, beans, and salsa, breaking this bar in half for a dessert is delightful. I have plans for it to replace my larabars for those trips we take when it's oh so useful to have a bar or two on hand...just in case. I have yet to test this on the kids to see if it carries kid appeal. Funny enough, the kids and I rarely like the same flavors of bars. In the area? Stop by Advance Health and pick up a raspberry chocolate Raw Revolution bar, and say hello while you're there!